Hospitals no longer present a picture of neglect with a distasteful lingering aroma of disinfectant. Some of these modern institutions of succor are indistinguishable, in every way, from the glitzy structures that abound in the city. However, time has stood still in the area of waste management and changes over the past few decades can best be described as minimal -- if at all. With the two-year extension of the government deadline to manage their waste coming to an end on June 30 th , there seems to be a lot of confused inertia in medical institutions and government circles. The day marked the deadline for setting up/installing methods to dispose of bio-medical waste ( bmw ) at all hospitals and nursing homes in towns with populations of 3 million and above, and all hospitals and nursing homes with 500 or more beds. But as expected, little has been achieved in this area. In Delhi, the 27 big and 55 medium sized hospitals and about 2,500 nursing homes and dispensaries generate about 200 tonnes of waste, of which 70 tonnes (35 per cent) is infectious. In 1999, Srishti, a New Delhi-based non-governmental organisation ( ngo ), found that about 93 per cent of these hospitals have not only flouted bmw rules, but also ignored the 1995 Supreme Court order which directed medical institutions and nursing homes to install facilities to take care of its bmw and dispose of it properly. Interestingly, the Delhi government plans to come out with another set of stringent guidelines to check the disposal of untreated bmw . Another survey being conducted by Srishti, along with the Delhi Pollution Control Board ( dpcb ), shows that of 70 Delhi hospitals, not one is segregating or disposing of its waste properly. Besides, not a single incinerator is in proper working condition. Most are being operated at 150C, which is way below the safe temperature of 1000C. The rules, without doubt, have put pressure on the authorities, but it is also clear that hospitals do not want to accept responsibility for cleaning up their waste. Recently, Delhi's health minister A K Walia agreed that several government hospitals and dispensaries have no proper facility for safe disposal of their waste. Bio-medical waste rules The Bio-Medical Waste (Management and Handling) Rules ( bmw rules) were promulgated in July 1998 and had a staggered implementation schedule (see table: Slow but steady ). But owing to pressures from the healthcare lobby, the deadline was extended by a full six months to the end of June. The bmw rules have tried to address the problem of hospital waste management and responsibilities have been fixed. For instance, the rules say 'it shall be the duty of the occupier of an institution generating bio-medical waste, which includes a hospital, nursing home, clinic, dispensary, veterinary institution, animal house, pathological laboratory, blood bank, by whatever name, to take all steps to ensure that such waste is handled without any adverse effect to human health and the environment'. The rules also stress the need to make it compulsory to segregate waste. They also have details on maintenance of records, accident reporting and follow-up and import and export methods. Meeting the deadline bmw rules have been flouted since they came into being in July 1998. "There have been pockets of change in the handling of medical waste, but by and large, the overall situation has not changed," says Ravi Agarwal, coordinator of Srishti. Findings of a Central Pollution Control Board ( cpcb ) survey reveal that most hospitals are burning waste, some even burning plastics and releasing harmful dioxins into the atmosphere. The situation is equally pathetic in other big cities of India. In Patna, Bihar, over 90 per cent of the hospitals have no waste disposal facilities, and the liquid waste and human organs are dumped into the nearest river, which is a source of drinking water. Various hospitals and nursing homes in Jammu and Kashmir are violating bmw rules and polluting rivers, lakes and other water bodies such as Anchar Lake in Srinagar. In Shimla, hospitals dispose of their non-segregated waste in municipal bins. With rag-pickers scavenging in these bins there is the danger of spreading various diseases, including the Human Immuno-deficiency Virus ( hiv ). The latest World Health Organisation data shows that about 18-16 million people, such as rag-pickers and nurses, contract hiv due to needle-stick injuries. If separation at source is not carried out properly, polyvinyl chloride ( pvc ) plastics that should be disinfected and shredded, end up in incinerators where combustion produces dioxins. "Despite the notification, no hospital follows the procedures laid down for the segregation of waste at source," laments Iqbal Malik of the New Delhi-based ngo , Vatavaran. At the same time, the Delhi High Court recently issued notices to eight of the city's major hospitals for not having proper incinerators to deal with their waste. The Municipal Corporation of Delhi-run Hindu Rao Hospital has an incinerator, which has not been working for the past four months. Most incinerators are located within hospital campuses and pose a danger to people living nearby due to toxic emissions. The Srishti surveys show that most incinerators (85 per cent) run at incorrect temperatures, do not completely destroy the waste, are not fuel efficient and often out of order. 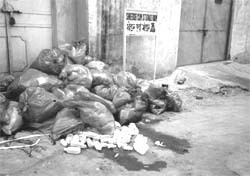 In some hospitals, such as the Safdarjung hospital in Delhi, having an incinerator does not prevent hospital waste (syringes, blood bags, glucose bottles and gloves) from finding their way to a nearby slum, Maharishi Balmiki, where it is handled by rag-pickers, kabariwalas and others for recycling and reuse. The picture that emerges is one of complete carelessness on the part of various medical institutions and state governments to deal with the problem of growing hospital waste mismanagement. Now with the deadline over, they are groping in the dark and looking for people/institutions that can help them manage their waste. The government is looking at the ngo s for help, while the ngo s feel that government cannot wash their hands off the problem so easily. Although nothing much has been done in the field of hospital waste management in the country, a beginning has been made. The cpcb does not want to come down heavily on medical institutions but wants to first give a warning and only then take legal action against erring institutions. Experts feel that in a poor country like India a crackdown on medical institutions will not be fair. "At the moment, we think we should be publicising the law more. It is a fairly new law and there may be some owners of nursing homes who may not be aware of it. But once enough publicity is given, we will not give any more time to these people," explains Rajiv Talwar, chairperson, dpcc . To encourage a centralised approach to medical waste disposal, the Delhi government has invited contracts from a private operator to use its disposal facilities for four government hospitals and private nursing homes on a fee basis. Chennai and Bangalore have set up centralised waste treatment facilities and have won accolades for managing their hospital waste. Delhi is also trying to set up a centralised facility but needs land at a subsidised rate. The issue has now become extremely controversial. The Kerala government has notified the state pollution control board as the "prescribed authority" for permitting collection, reception, storage, treatment and disposal of bmw . Although so much is happening in the field of hospital waste management, the health policy still does not include the issue, laments Ravi Agarwal. If the problem of hospital waste is to be resolved, the bmw rules need to be taken seriously and followed cautiously. Otherwise these rules will also remain buried in a whole lot of other rules being framed from time to time, and we will continue to risk public health and environment.